Winx is pretty, fun and easy to understand. I mention easy to understand specific as players seem sometimes a bit divested by the two big plates of explanation. 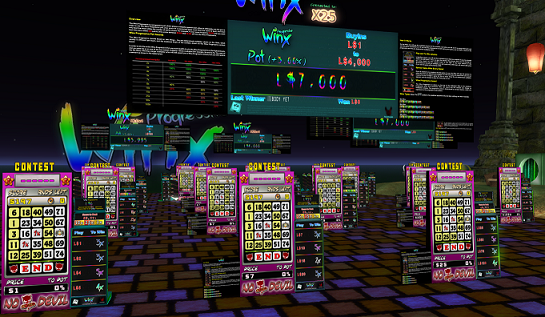 Other operators might use different settings but we run Winx with a different pot for each configuration. The machines are standing in rows with the progressive pot displayed above it. We use a wide margin on the pot (300 points on No Devil) so you make a better chance on winning it. The downside is that the pots are not utterly high. The Winx on the picture shows a score to beat of 57,111. Beat that score on the No Devil machine and you win a prize. After you play, a new multiplier is selected random for the next game. Only for the amount you play, the other multipliers remain as they are. Winning 15 times the pay in on a score of 57,111 is very attractive but of course you hope getting a even higher multiplier next game. It can go all the way up to x50 on this particular Winx. If you earn a very high multiplier and you don’t play it, you’ll leave it for the next player. It will stay there until someone plays it. So normally you’ll have to start the first game with a relativly low multiplier. On the example shown here, the previous player left a pretty good deal on L$20 and a even better one on L$10 unused. 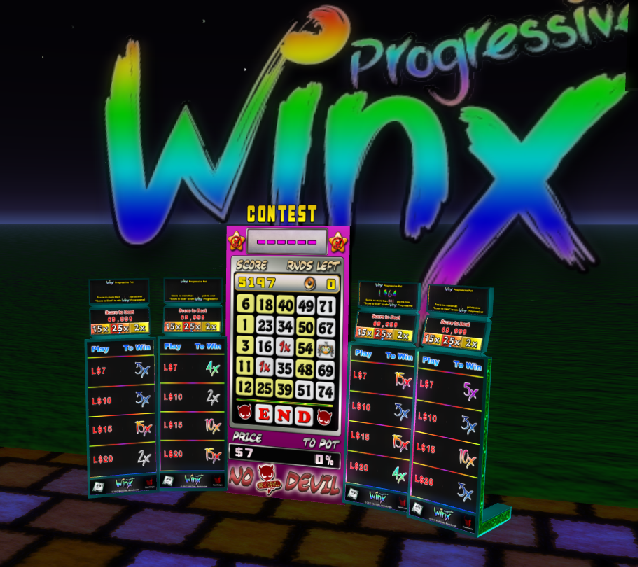 Above a row of games with Winx you see a board showing the Winx progressive pot. The little picture saying it is connected to x50 Winx progressive games we put ourselves. 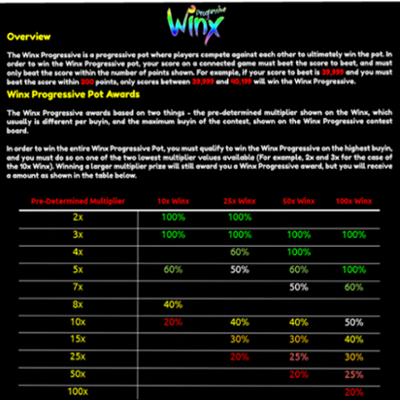 So if it is unclear what is the maximum multiplier at a certain Winx you can always look at the progressive pot. Note that regions with other operators might have different settings. The most common setting is one pot for the entire region. Nothing wrong with that but we prefer doing it different. At the winx itself we see a totally different pot mentioned: L$35. 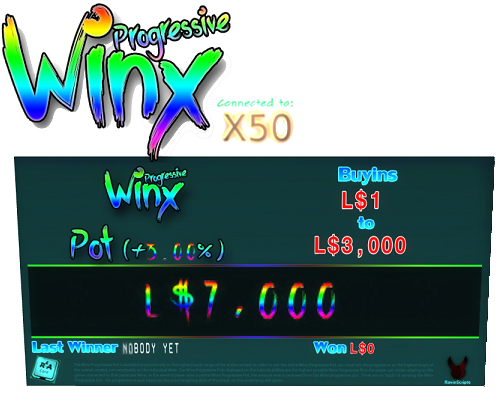 This is the highest pot one can win playing on this Winx. The maximum buy in amount on this Winx is L$20 and the pot is awarded proportional to the buy in amount. 46, but the Winx shows 35??? Yes, that’s because this story has one more chapter. Let’s first do the easy part: How you win it? 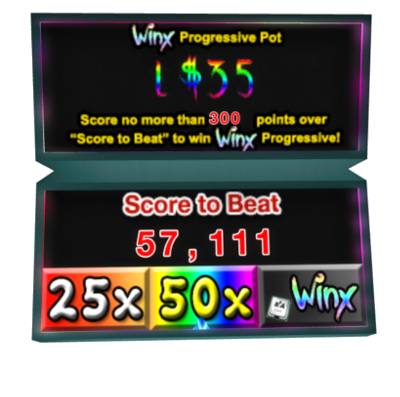 You win a Winx Progressive (and thus a certain share of the pot) when you beat the target score but not with more points difference than displayed, in this case 300. So, if you score 57,112 op to 57,411 you will win both the game (and get paid for it) and the pot (and get paid for it). If you score more, you’ll win only the game (and get paid for it) but nothing from the pot. So we calculated the maximum pot for a L$20 game as the total pot divided by the highest buy in amount and then multiplied by 20. But….that is the maximum pot. The maximum pot doesn’t necessarily have to be the pot you can win playing this game. You can win a percentage of the maximum pot, ranging from 20% up to 100%. In our example we play on a Winx with a maximum pay out of x50, for the L$20 the current multiplier is (scroll a little bit up to see the Winx again) x10. If we look up x10 in the column of x50 Winx then we see 40%. Earlier we calculated that the maximum is L$46. So, 40% of L$46 is L$18. 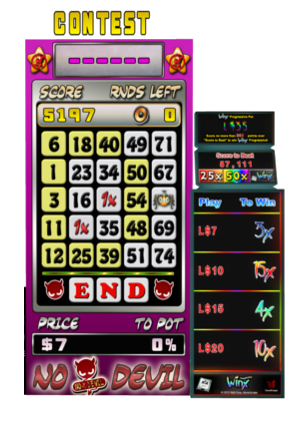 Pay the game L$20 and win it and you will win L$20 x 10 = L$200 and if you win it with a score in the range 57,112 – 57,411, you’ll get an extra L$18 from the pot. 18??!! but the f**king thing says the max to win is L$35 ?!!! PS: The best way to deal with this confusion might be to ignore it totally. Read on…. Wow..and why does anyone play this? You might find this long long explanation about how to count which amount to win on a pot a bit silly. Perhaps you find it even more silly that all the amounts shown somewhere are anything but the pot you can win on this game. And you might have a point in that. Though, pretty things sometimes are silly. And it isn’t as silly as the girls make up. Is it? You don’t have to calculate the exact pot you can win. * High total pots are good. * Low multiplier = Higher share of the pot. * The pot doesn’t replace your winnings. It is a extra win. The fun of Winx is that when you play a low multiplier you can win a high share of the pot. When you play a high multiplier you can win that high multiplier and still something of the pot. And…you never know what the next multiplier is gonna be. 50x your buy in with such a low score ain’t exactly bad odds either…. How does one do that? Scoring exactly in the range 57,112 op to 57,411? The most basic and often overlooked method is to stop playing. When you score came into the desired range, no matter how many jokers you have on your spinner, no matter how many rounds you have still left…Just don’t click a thing anymore and wait for the game to stop. When being near the score and you can make it, see if you can put your matches on that way that you won’t score too much, but still enough. E.g. placing a joker so it completes one line instead of two, or if you have multiple options in the round, choose the one that fits best. Knowing that you need to be above the target and preferably in the good range is already half the work. Practice a bit and you’ll see more and more opportunities. One of the many nice features of Winx…we can give you high odds on relative low scores. See this multi winx, after you play a game, all 4 winx will select a new multiplier. When you beat the score, all 4 will pay. So, that could end up pretty interesting. Personally I find the concept of Winx awesome. It complies to all skill gaming regulations, it is practical for operators and thus the scores can be set relative low, and it is easy to understand. It is also great fun to play, as long as you also don’t try to calculate the exact part of the pot you might win each game. Some game machines look dull. Just give it a shot and play, see if you like. The Winx of course, not the girl.